One of the improvements added to Windows 10 over Windows 8 is better support for multiple monitors. Windows 10 makes it easy to add a second monitor using familiar commands available in Windows 7. Let’s take a look at how to add and configure dual monitors on a Windows 10 PC. 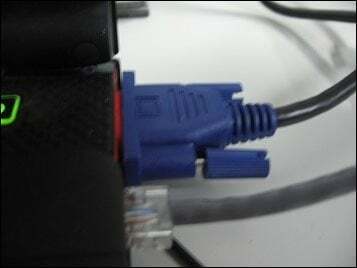 The first thing you need to do is connect the monitor to your HDMI, DVI, or VGA port on the PC. Press Windows Key + P on your keyboard. This will bring up a menu with a list of options. In my case, I need some additional screen real estate so I will go with the Extend option. Extend will place a copy of the Windows desktop on the second monitor with its options separate from the main monitor. In the example below my second monitor on the right. Here’s an idea of what setting up a second monitor using a laptop looks like. If you have unique requirements, you can adjust these using Display Settings. Right-click the desktop and select Display settings. 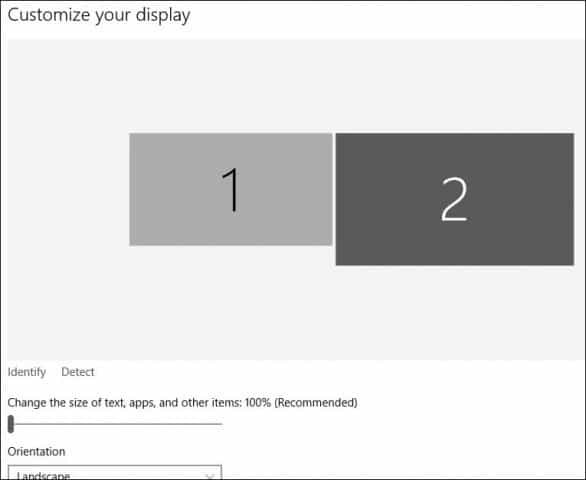 The Display Setting window will come up, and here you can make individual adjustments for each monitor. For example, the default screen resolution for monitor 2 is 1366 x 768, I can individually adjust settings for just that monitor without affecting the main one. You also have the option of changing the orientation of the monitor if supported, so if you read a lot of web pages, you can change from landscape to portrait. 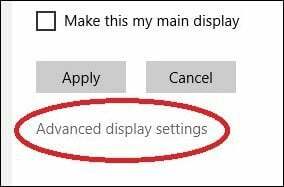 To change the screen resolution, scroll down and select Additional display settings. Click the Display you that you want to modify and then click in the Resolution drop-down menu and choose the resolution you want. Click Apply to confirm changes. One of the things you will notice by default, Windows 10 displays the Taskbar on both displays, but you can change this if you want. 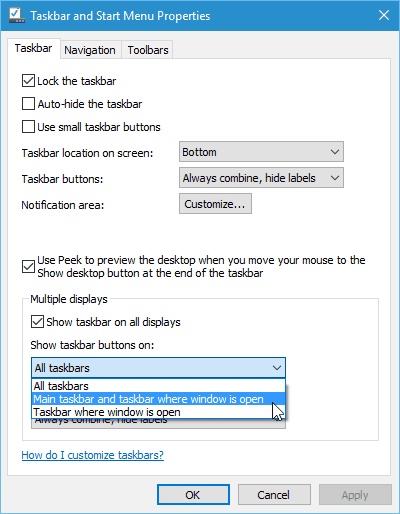 You’ll also get new options on the Taskbar properties when you enable Multiple Displays. 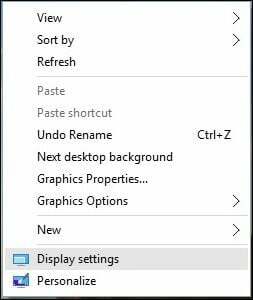 Here, you can choose to have the option of displaying the Taskbar buttons only on the primary monitor or you keep the default and have it on both. I prefer to keep it on both screens for convenience. It allows quick access to applications or the Start menu. If you do want to change it, just click on the Show taskbar button list box and select Main taskbar and taskbar where window is open. 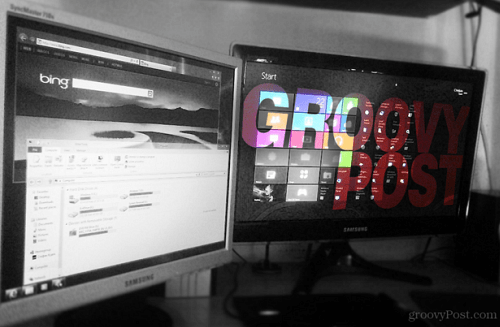 You can also customize how icons are displayed on the second monitor. Click Apply and OK and there you have it. You will notice this does not remove the Taskbar. Windows 10 also supports the new Snap Assist for multi-monitor setups. You can snap your favorite apps while interacting with others. Windows 10 makes being a power user a lot more fun and easy. Tasks like these used to be complex and required third-party support in some cases. If you have not tried it, definitely check it out and let us know what you think. Running an HP laptop with an additional monitor. Worked fine with Windows 7, but after upgrade to Windows 10, it will not detect the second monitor. Without resolution, will go back to Windows 7. I agree! 6 months later and Microsoft hasn’t fixed this problem! They hijacked my functioning windows 7 and left me with only one monitor and NO CLEAR EXPLANATION for how to reactivate the second. Bozos. in addition to my earlier comment. I have an older HP laptop and 2nd monitor, i’m running Windows 10. I didn’t have any problems with windows 7, Vista or Windows 10 running dual monitors until they did that major update last summer. I did get my 2nd monitor to work again but it didn’t hold. to use my 2nd monitor I follow this process, sometimes it holds for the entire time my computer is running, sometimes not and if I want dual monitors I have to go through the process again. Go to – Settings, Display – scroll down to Multiple monitors, click on ‘duplicate these displays’/’keep these changes’ (once the changes are shown on the 2nd monitor). then click on ‘extend these displays’/’keep these changes'(once the changes are shown on the 2nd monitor). maybe yours won’t default. Good Luck. HI my desk top has 3 monitors and windows 10 pro when I updated it all 3 were still there in place with the options on all 3 and the main in the center like I had it worked perfect at lease one thing did. 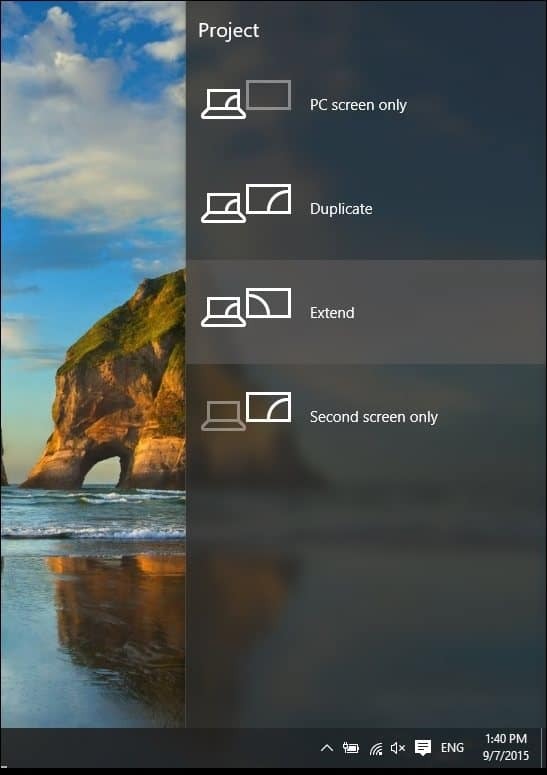 are you saying that all three of your monitors worked with windows 10, not duplicating the screen but stretching the picture on all three, running a different program on each? Glad to hear multiple monitors can work with Windows 10. I made no changes to my hardware when upgrading to 10, but my second monitor is not detected. I was using only the second monitor with Windows 7. Sorry I upgraded. I have 2 GeForce GTX 550 TI cards and 3 monitors attached I never tryed to attach a fourth no room. They all worked in windows 7 and when I updated to Windows 10 they were just fine no problems But I have Windows 10 pro. on my laptop I have Windows 10 home can not get things working on it. I’m not sure but I think its windows 10 home that has all the problems. I would like to know which cable is best/correct to use for connection. HDMI to HDMI or VGA to HDMI? Thanks, got it hooked up and running. Works great. Window 10 PC purchased Video Card NVidia GT730 and my 2nd monitor is not working. What is not working? You have several chooses 2 monitor as one or 2 separate monitors which is the way I have my 3 Monitors. Its all in the way you set up NVidia software my problem was also getting the order of monitor in the order I wanted which was the center one as my main, after playing around with it it worked fine. But that was before Windows 10! when I updated to windows 10 every thing was OK! The response received did not resolve my issue with trying to set up multiple screens. I have used the Extend option but the mouse bypasses the middle screen. It only works on the left or the right. 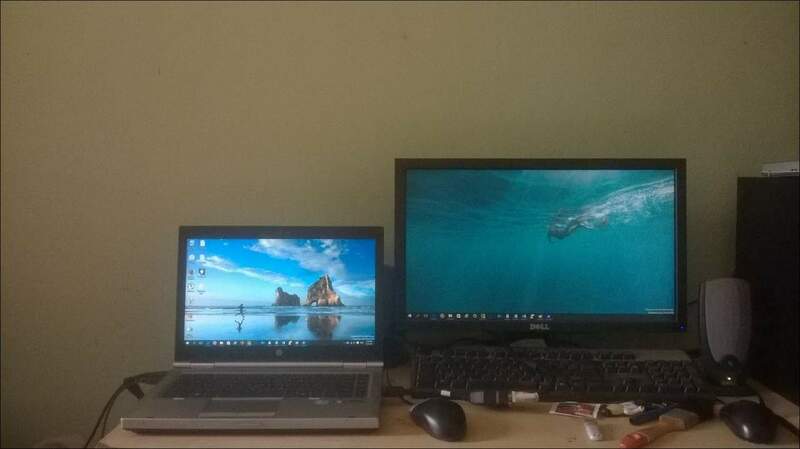 I need step by step on how to set up my laptop screen as screen 1, my left monitor as screen 2 and my right monitor as screen 3. My problem also. Running ASUS EX201. Don’t know if this is what everyone is experiencing & you may already have tried this. I have an Asus laptop running Windows 10. I attached a Dell Monitor to the laptop via a VGA to HDMI cord. I held down the Windows + P keys and selected Duplicate (Screens). Windows 10 said it did not detect, but I could see the laptop screen duplicated on new monitor. I wanted to set resolution etc. for the bigger second monitor. Finally in the hidden icons at bottom in task bar, I saw “Intel Graphics Settings”. I clicked on that & got a window that gave me a “Display” choice. I selected “Display” and when a new window came up, a pulldown allowed me to select the built-in or the name of my second monitor, Dell. I selected the name of the new monitor. The settings were fine…auto selected for me, but I could change settings if I wished. Sorry this is so long but I am not a computer expert. Bottom line: You may be able to set the monitor via a graphics setting. HDMI is a digital signal. VGA is an analog signal. This is why your monitor isnt working. You need either HDMI> HDMI or HDMI > VGA. I had exactly the same problem. I went back to Windows 7. I tried all the ways posted in this blog, no luck. My monitor was still not detected. Not sure what to do now. Does anyone know how to make the extend screen option the default. I unplug at work each night from my second monitor, re-attach each morning and need to switch from PC only to extend screen each day. Looking to save 11 secs of repetitive tasking. thx. Instead of buying Linked in fix this problem ….! I just purchased a new computer with Windows 10. I have always used 2 monitors with an extended display. I can duplicate the display but it won’t extend the display. I’ve tried everything, does anyone have a fix for this? This is my problem too. I have a Dell Optiplex 990, it detects the second monitor but will only duplicate it. How can I get it to Extend? Have you tried unplugging the monitor. then do a restart and once its up… tried again. i have Dell inspiron 5010 updated windows 8 to 10 and second display is not detected. tried all solutions given above bu no joy. Running Windows 10 with two monitors. Question: I’m a bit unsure on how to open the “Taskbar and Start Menu Properties” window. Even with windows search I can’t find it. Question2: The taskbar is on both displays. Is there an option to open apps from the start button of the display I click? Example: If I open Microsoft edge from my second display I want the app to start on the second display. Right now it starts from my main display regardless of what taskbar I click. 1: Right click taskbar and select settings, you will find the option to display multiple task bars or not there. 2: In my experience the windows open from the last spot that you used them or wherever you closed out of them. I have not found a setting that affects this yet. Hi! First, the post was great. I have a question: I have two Samsung Monitors (24) and a Radeon r7 370 with a 8370 Eight Core processor and 16 GB of RAM. The thing it’s the second monitor always turn off from one moment to another with no aparent reason. Do you know what could it be? Thanks a lot!! Ive always extended my displays but with W10 my taskbar appears on BOTH screens (unlike only one in W7). I cant get my complete taskbar on screen 2. By that I mean that on screen 2, the windows icon and other shurtcut icons, but the battery information, the time, date, language…., that are always on the right side of the taskbar does not show. Any ideas. Just attached a 2nd screen, but my PC is only detecting 1 screen. I have pressed “Windows” button & “P”, but when I click extend, it doesn’t find the 2nd screen. In display settings it only shows I have 1 screen. Exactly the problem I started this with. I use a laptop with a separate monitor. I only use the separate monitor. Had to go back to Windows 7. Works great with Windows 7. It’s a work PC, so can’t revert back to Windows 7 !!!! I’m having the same problem. It seems that the problem is with Windows 10 Home, has anyone figured out how to get around this? Thanks much. My HP creates a duplicate poorly, positioningis out on second display. If i extend, when I click firefox, it always opens in forst screen, I want it to open in second, with a second and different firefox in first. Whatever I do, firefox will only ever display on screen 1. Incredible quality of life tip, i switch frequently and i was sick of going into the vvidia settings. This tip works perfectly for me. I only use the second monitor because of the small size of my laptop screen. Windows 10 will not DETECT the second (my main monitor), so Windows 10 is completely useless. None of the settings will work if the monitor is not detected. Windows 7 works great. I have Windows 10 laptop and external monitor. I keep my laptop closed at all times and only use the monitor. I’ve set Display Settings/Power Settings to turn off in 15 mins, but no effect. The monitor does not turn off. I am using a MacBook Pro with Parallels in the virtual environment to run Windows 10 Pro, and need to connect 2 monitors to Windows 10. My Mac sees the 2 monitors perfectly, but Windows 10 doesn’t even recognize them. Where are the settings for adding multiple monitors to Windows 10? what do I need to do for my laptop to recognize the 2nd monitor again? prior to the Windows 10 update i didn’t have any problems with my 2nd monitor. After, my 2nd monitor was working intermittently. sometimes I could get it to work by unplugging the 2nd monitor and doing a restart. sometimes I had to go into devices and uninstall the 2nd monitor..
the monitor is working now. display settings had reverted to ‘show 1 – I tried to extend and nothing showed up on the 2nd monitor. , so I changed display setting to show 2 and it was displayed. then I click on extend again and it worked. it could be that my laptop and 2nd monitor are old and needed persuading. I’ll get back to you if it quits working again. Thank you! I need two independent programs/displays open at same time, one on my laptop and the other on 2nd monitor. Found the answer here, after scouring Windows 10 Help but finding no answer. What I’m left wondering is whether Windows 10 Help was written by folks still in their early stages of English as a second (or third or fourth) language, or whether Help was written by folks SO much smarter that they can’t imagine someone being as incapable as me. Or maybe it’s both. At any rate, thanks for your post. Hi, I have no issue adding a second monitor with Windows 10, either via HDMI or VGA output. However, if I connect additional monitors to both ports, although detected, I can only access one. Can a third monitor be added?? I remote from work and need to use two monitors at home (which I have). My problem is I cannnot drag over an excel sheet to the other monitor in order for me to work out of two seperate programs which I need. What am I doing wrong? I have the monitor set up in the Extend mode. How should my cables be hooked up with my monitors?